When making stereo 3D video by converting from 2D or using computer graphics, you never face the problem of different color shades or vertical parallax between right and left stereo views. But for camera-captured stereo sequences, mismatches resulting from hardware deficiencies are inevitable. Usually, temporal synchronization is well-preserved by modern stereo cameras, but geometry, brightness and color matching are not as accurate. Tilt and vertical parallax between stereo frames can cause you a lot of headaches. Color shade variation is also a common problem for stereo-to-multiview conversion. Both of these mismatch types can greatly harm the aesthetic quality of your resulting 3D video. YUVsoft Stereo Correction technology eliminates the problems of geometric distortion and color differences in the source stereo pair. The algorithm has several processing modes controlled by a number of options. The Correct color option aligns shades for given objects or patches in both the left and right frames. YUVsoft’s Motion estimation technology performs object matching. The Correct geometry option is for eliminating geometric distortion. This mode performs the necessary operations to give you output frames that only exhibit horizontal parallax between the input stereo pair frames. The YUVsoft Stereo Correction plugin automatically corrects geometric distortion and color shade variation between input frames. All you need to do is enable the Correct geometry and Correct color options in the Stereo Correction toolbar. YUVsoft Stereo Correction technology does not provide any visible results or benefits for rendered video or video obtained using conversion methods. But this algorithm is a good solution for captured video. 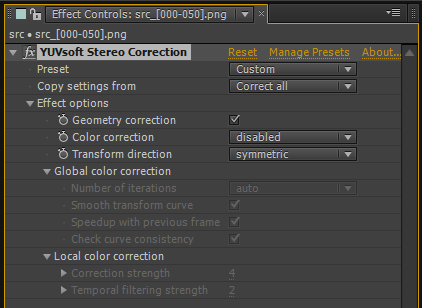 Stereo Correction fixes color shade differences between the left and right views of your input sequence, in addition to eliminating the problem of geometric distortion between the views of your source stereomate. You can supply stereo pairs corrected using this approach to the YUVsoft Stereo-to-Multiview conversion tool to obtain higher-quality multiview video.